Dr. Craig Considine, a Catholic Irish, is a well-known sociologist at Rice University in Houston, USA. Last year, he tweeted about 9/11 and Prophet Muhammad. A tweet that went viral and it showed how when people choose to read about Islam without any clouded judgment, the truth will set them free. Such a positive stance towards Prophet Muhamamd (peace be upon him) from a Catholic isn’t taken down well by many, but that doesn’t deter Dr. Craig. 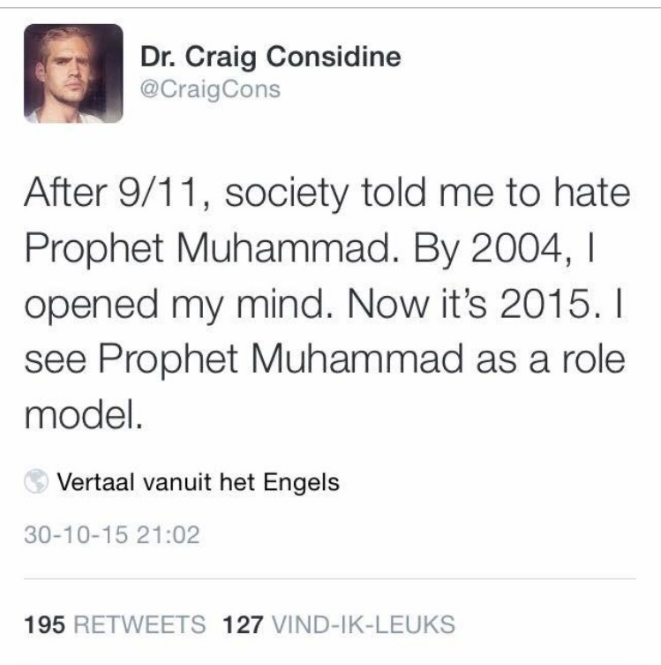 Such a tweet is not a one-off by Dr. Craig, but in fact he regularly makes a firm stance against Islamophobia and the rise of hatred against Muslims even by those like Donald Trump. Peace be with you and welcome to my website. I am a Catholic American of Irish and Italian descent. I was born and bred in Needham, Massachusetts and have studied in Washington, DC, London and Dublin. As a sociologist I focus on many topics including religious pluralism, Muslims in America, Islamophobia, Christian-Muslim relations, the life of Prophet Muhammad, race and ethnic relations, and the intersection between religion and nationalism. Such a positive voice amongst all the Islamophobic rhetoric is indeed refreshing. I can definitely agree with every word! Your input on a variety of topics, is really very enlightening and no doubt comes from an informed, thoughtful and wise place, something very hard to find, especially on social media platforms, in this era. Amongst all the mingling voices of ignorance, and therefore fear, and prejudice, yours stands as a beacon of clarity and courage, and for that I am very appreciative of.